Welcome to La-La Weekly Wednesday Challenge! I'm Kristine and am your hostess this week. Just want to give a big huge THANK YOU to all you lovely ladies who joined us in last week's "Make-your-own-flowers" Challenge!! 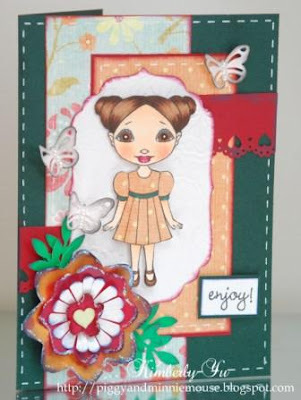 It's awesome to see your wonderful creations... especially with our stamps and digis! 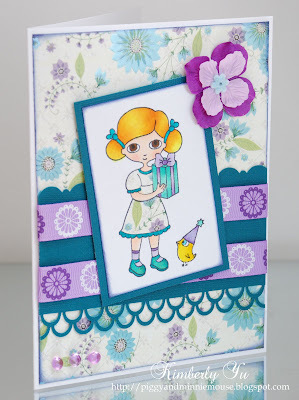 My challenge for you this week is one of my faves... PAPER PIECING!! Some members of our design team have posted some wonderful tutorials on paper piecing if you'd like to check those out before you start. You can find Jane's Here, Maureen's Here, and Jana's Here. 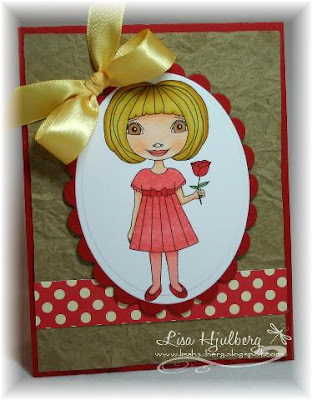 For my card this week I have used Rosie with Bird, and so this cute rubber stamp will be on sale 20% OFF this whole week making her only $8.80... What a deal!! 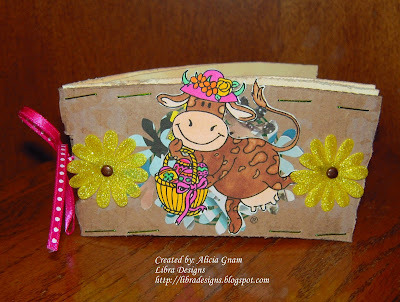 Everyone is welcome to play, but to qualify for Top Three and for the prize your project MUST have a La-La Land Crafts stamp on it!! You are welcome to use any other stamps along with LLLC images, such as sentiments, background, etc. Link your project to Mr. Linky below by Monday, April 5th, 2010 at 11:59pm PST (GMT-8). 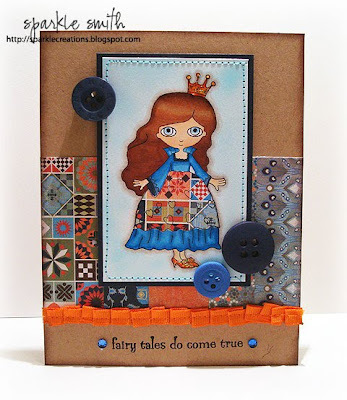 Be sure to link directly to the blog or gallery post featuring your entry! If you post your card on Splitcoaststampers, please use BOTH keywords LLLC and LLWWC32. This challenge is now closed. Thank you to everyone who got to play along with us this week!! Please come back on Wednesday when we post our new challenges!! Hello, La La Land Crafts fans! 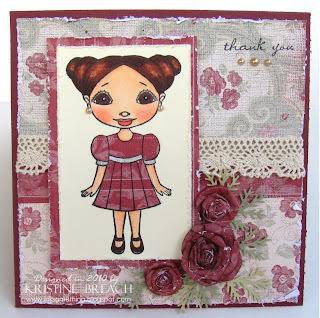 Thank you so much for playing along with our MAKE YOUR OWN FLOWERS challenge last week! We had a great time visiting everyone's blog and seeing everyone's wonderful creations! They are all amazing! 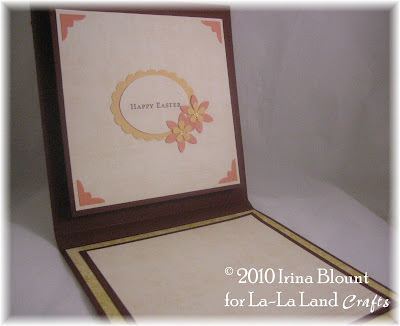 Unfortunately, some entries were not eligible to win the $10 credit to the online store or to be picked as Top Three because they did not include at least one La La Land Crafts stamps/images. If you don't have any, please stop by our online store! The recent release are both in digi and rubber. Kate, you are also the winner of $10 store credit to our online store! Ladies, please email Irina to claim your credit and the Top Three badges!! Please come back tomorrow for the next week's challenge!! Welcome to another La La Weekly Wednesday Challenge! It's Kim and I am this week's hostess! Before I get to this week's challenge, I would like to thank everyone who participated in last week's LLWWC#30 - RECYCLE IT Challenge. 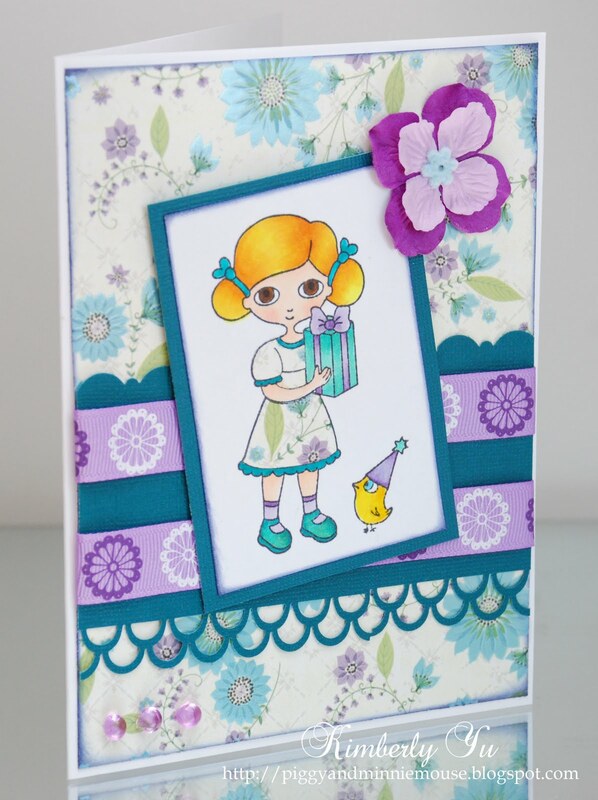 We were so happy to see your cards with LLLC stamps! There are LOTS AND LOTS of ways to make them! IMPORTANT!! We have made a few changes! 1) Create a NEW card/project for the challenge. You are more than welcome to combine challenges! 2) Everyone is welcome to play, but to qualify for Top Three and for the prize your project must have one of La-La Land Crafts stamps on it!! You are welcome to use any other stamps along with LLLC images, such as sentiments, background, etc. If you do not have any of our stamps yet, you can start your collection by purchasing one or more of our new DIGI stamps! DIGI stamps are now available in our online store. Plus, for anyone who prefers rubber, these digis are now in RUBBER! 3) Link your project to Mr. Linky below by Monday, March 29nd, 2010 at 11:59pm PST (GMT-8). 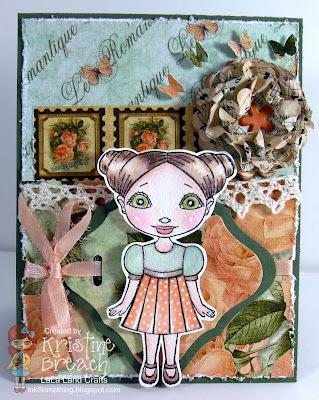 Be sure to link directly to the blog or gallery post featuring your entry! If you post your card on Splitcoaststampers, please use BOTH keywords LLLC and LLWWC31. 4) Create the link to this challenge (link back to us) in your blog or gallery post. The winner of the challenge will receive a $10 CREDIT to spend in our online store!!! 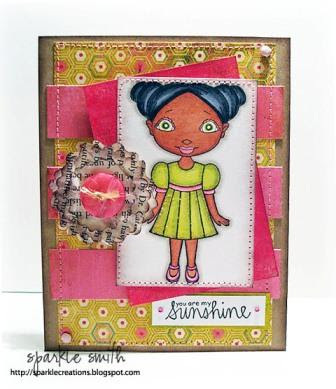 The stamp that I am using on my card today, PORSHA, is on SPECIAL this week for $9.60! That is a savings of 20%!! For inspiration, check out my awesome team's creations! Hello to Everybody! 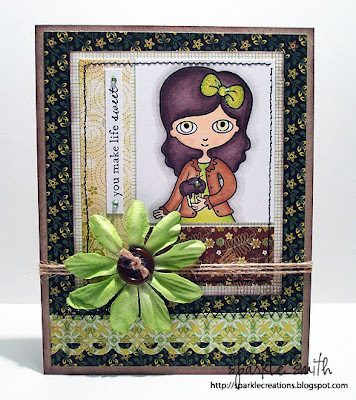 Thank you so much for playing in my Recycle It challenge last week! 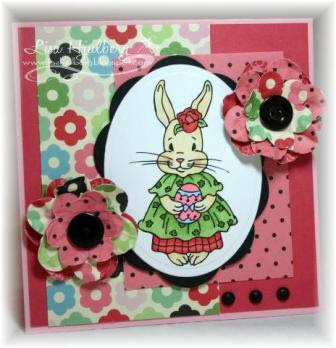 I was simply amazed by all the creative entries and varieties of recycled finds on your projects! 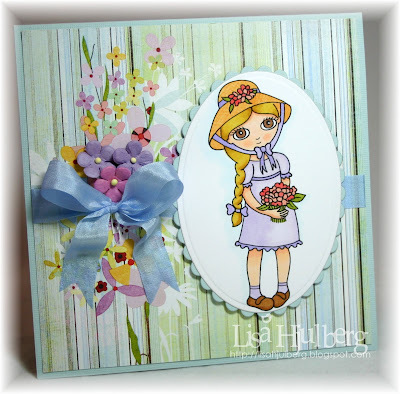 It was such a pleasure visiting your blogs!Unfortunately some entries were not eligible to win the $10 credit to the online store or to be picked as Top Three because they did not follow the new requirement that all entries use at least one La-La Land Crafts stamp. So if you don't have any yet, why not hop over to the online store and treat yourself to a stamp or even more? And don’t forget about our latest release was all digital stamps so you can get some images right away to play in our next challenge! Okay, let's see who the winners are of the challenge this time! Congratulations ladies! Please email Irina for your Top 3 badge! Kimberly, you are also the winner of the $10 credit to the online store! Please email Irina so she can get that set up for you! Thanks so MUCH again everyone for playing along this week! We will be posting a new challenge tomorrow, please come back and join us! 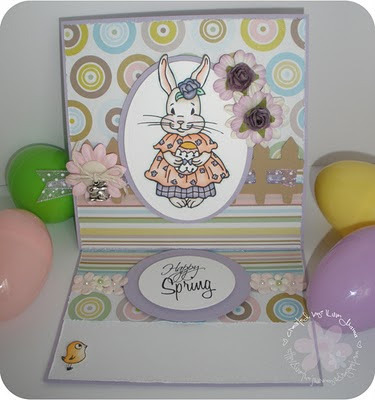 I know you all loved our new Easter Images in Digi Stamps. Thank you SO MUCH for the great response!! For those of you who are like me.. and I just LOVE the feel of the rubber stamp in my hands ;-) here are great news!! 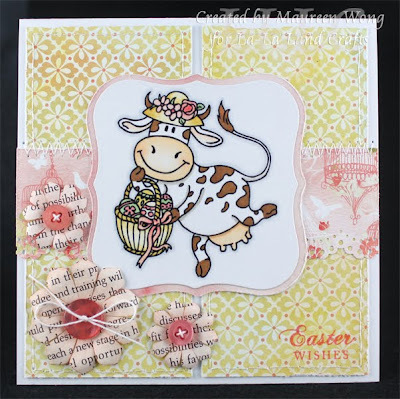 We have just received a shipment of the same Easter images in RUBBER!!!! They are already available in our online store!!! ... since Easter is just around the corner, we promise to ship your purchase the very next business day!! Hello everyone! Lisa Hjulberg here. I'm a bit late in posting my challenge card, but here she is... Lala With Rose, reminding us to respect Mother Earth! I just love this sweet image from the Easter Release. Actually, I love all the images! Did you know you can buy the bundle of SIX for just $20? Woot woot!!! What are you waiting for? 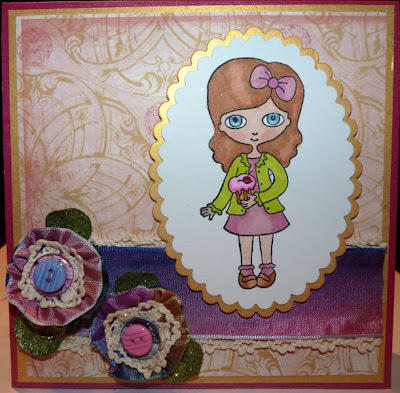 And then jump on in and join this week's challenge for a chance to win a $10 Gift Certificate to spend on rubber stamps in the La-La Land Crafts store. The name of the game is "Go Green" as in Recycle! 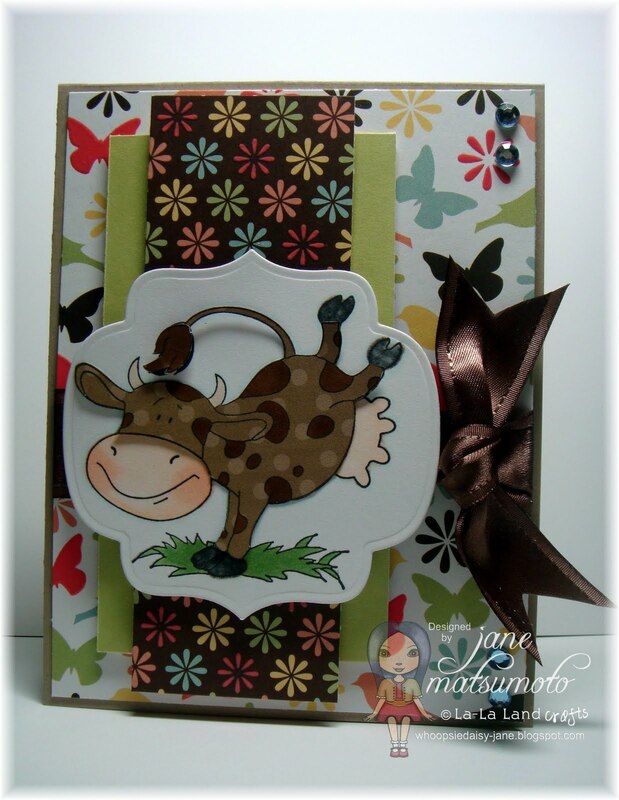 The recycled element of my card is the crinkled up background paper which was packaging material in a recent shipment of craft goodies. 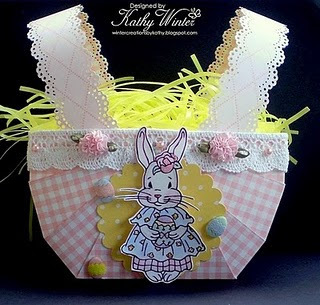 The polka dot paper and ribbon were also "cast-offs" on my craft table, rescued from what would have eventually been a trip to the rubbish bin. I can't wait to see what you come up with for this fun challenge! Enjoy! Hello and welcome to another La-La's Weekly Wednesday Challenge! It's Elena and I am your hostess for this week's challenge! Before I get to the challenge, I would like to thank everyone who participated in last week's LLWWC#29 - Pastel Colors Challenge. 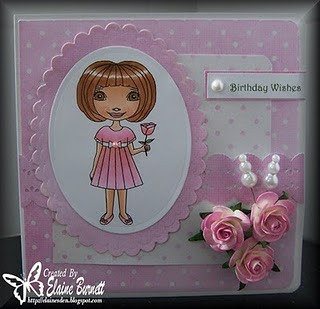 We were so happy to see your cards with LLLC stamps! 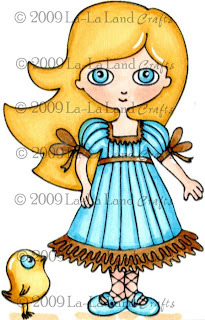 2) Your project must have one of La-La Land Crafts stamps on it!! You are welcome to use any other stamps along with LLLC images, such as sentiments, background, etc. If you do not have any of our stamps yet, you can start your collection by purchasing one or more of our new DIGI stamps! DIGI stamps are now available in our online store. 3) Link your project to Mr. Linky below by Monday, March 22nd, 2010 at 11:59pm PST (GMT-8). 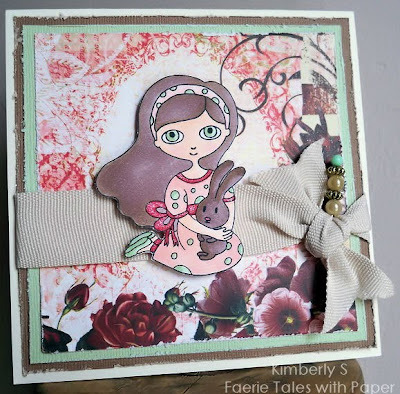 Be sure to link directly to the blog or gallery post featuring your entry! If you post your card on Splitcoaststampers, please use BOTH keywords LLLC and LLWWC30. 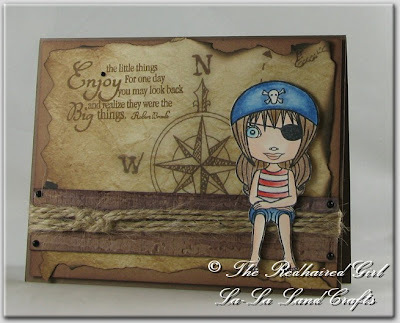 The stamp that I am using on my card today, PIRATE LALA, is on SPECIAL this week for $9.60 that is a savings of 20%!! Looking for inspiration? 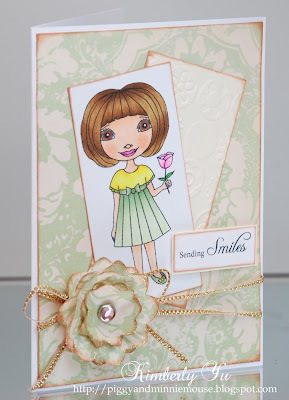 Check out what the Design Team and Guest Designers have come up with for you! They have a real eye candy for you! :) We hope you'll play along with us!! 4. Jude 5. Gloria M.
Hi everybody! 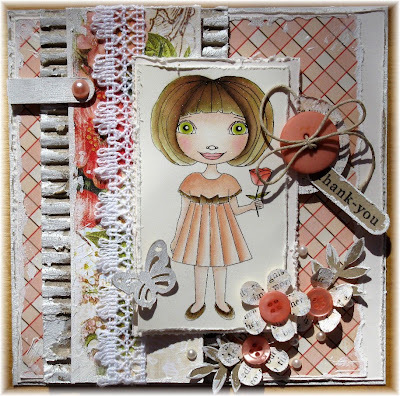 Thank you so much for playing in my Pastel Colors challenge last week! Once again I was amazed by all the fantastic entries and had a really hard time choosing the winners. 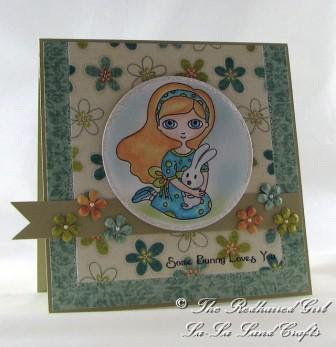 Unfortunately some entries were not eligible to win the $10 credit to the online store or to be picked as Top Three because they did not follow the new requirement that all entries use La-La Land Crafts stamps. If you don't have any yet, why not hop over to the online store and treat yourself to a stamp or two or more? Also, our latest release was all digi so you can get some images right away to play in our next challenge! Well, enough talk! I know you're here to see who the winners are, so let's get to it! Kathy, you are also the winner of the $10 credit to the online store! Please email Irina so she can get that set up for you! 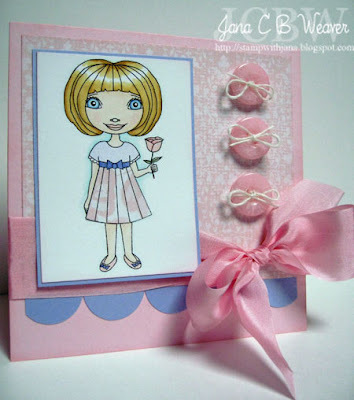 Here is my card for this week's PASTEL COLORS Challenge hosted by Maureen. Please scroll down or click HERE for details, to participate and to see more samples made by our Design Team. I've been wanting to make this kind of card for a loooong time!!! I really love this frame-like look of it. This card measures 5 3/4" x 5 3/4". 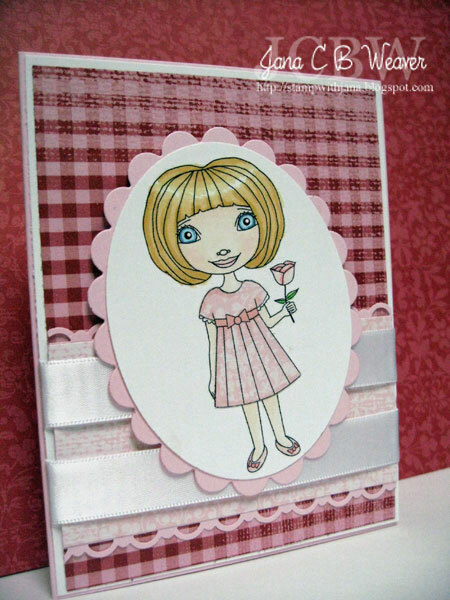 Websters Pages designer paper from their 6" x 6" paper stack, I just can't get enough of it!! Martha Stewart grass border punch. 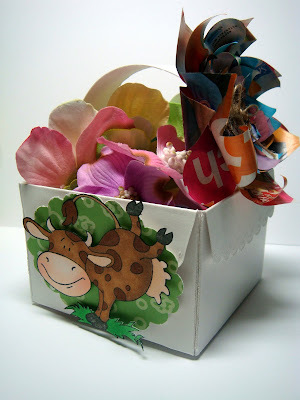 EK Success corner and flower punches. 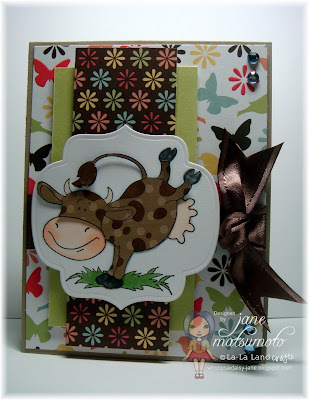 Background stamp is from Magnolia. Butterfly stamp from Martha Stewart clear stamp set. 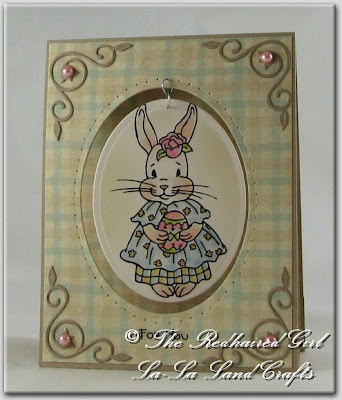 This Rosie stamp is one of our new Digi Stamps, it can be purchased HERE. Oh, and best of all, it is on SPECIAL this week at 20% OFF!!!! 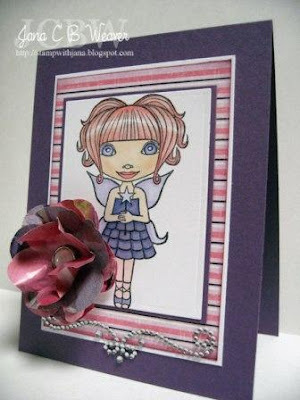 For this card I printed Rosie on Coconut Swirl cardstock by Bazzill at 3 1/8" tall, the image was colored with Copics and cut out..
For this week's challenge please scroll down to the post below or click HERE..
Oh, what fun it was to read all of your comments about our new release!! Thank you SO MUCH to everyone!!! 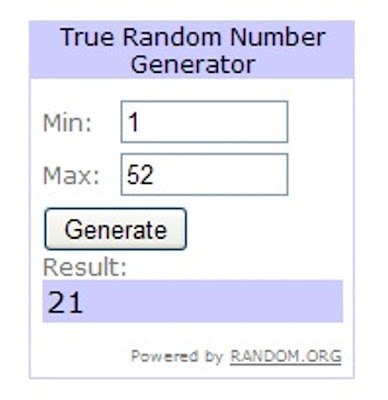 I have picked a lucky number using random.org..
Congratulations Jo!! Please contact Irina with the "secret" phrase to collect your prize :-) . It's Maureen and I am your hostess for this week's challenge! 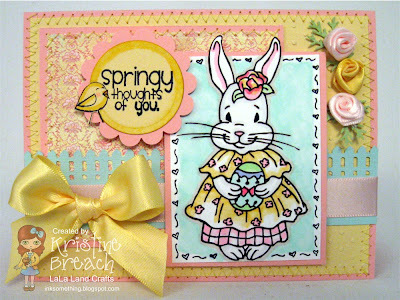 Before I get to the challenge, I would like to thank everyone who participated in last week's Spring Blog Hop! We hope you had as much fun as we did!! 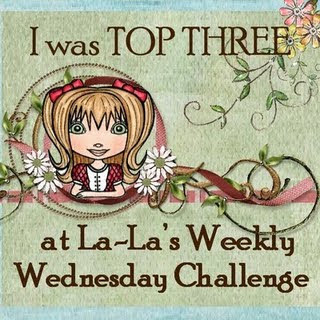 Now onto La-La's Weekly Wednesday Challenge #29! 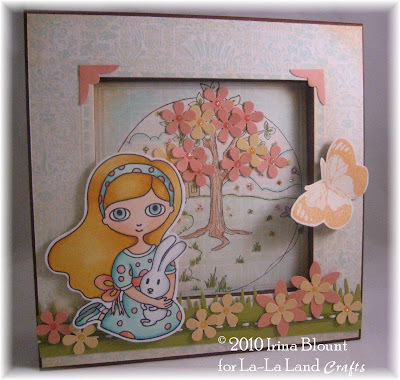 Because La-La Land Crafts recently released all these fabulous Spring digi images, I decided to do a color challenge - please use PASTEL COLORS for your creations. 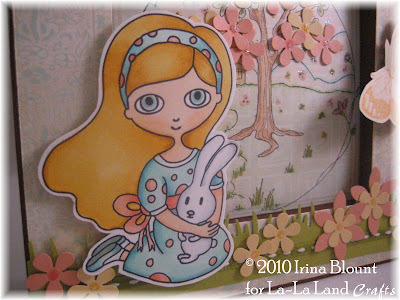 2) You may ONLY use La-La Land Crafts stamps!! If you do not have any of our stamps yet, you can start your collection by purchasing one or more of our new DIGI stamps! DIGI stamps are now available in our online store. 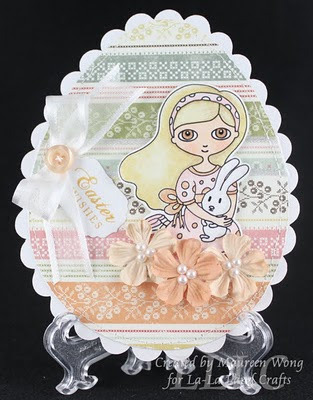 Better yet, the digital stamp that I used on my card, EASTER BUNNY ROSIE, is on SPECIAL this week for only $3.40, that is a savings of 20%!! 3) Link your project to Mr. Linky below by Monday, March 15th, 2010 at 11:59pm PST (GMT-8). 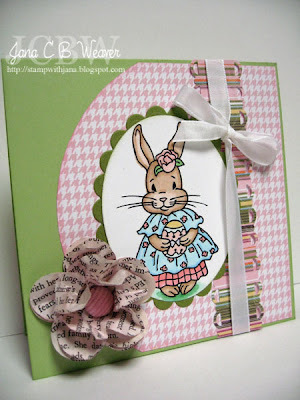 Be sure to link directly to the blog or gallery post featuring your entry! If you post your card on Splitcoaststampers, please use BOTH keywords LLLC and LLWWC29. Looking for inspiration? Look no further! Check out what the Design Team and Guest Designers have come up with for you! We hope you'll play along with us! !